“I just can’t sleep at night knowing that our delicious Hawke’s Bay apples could go to waste. The apple industry drives our economy and creates thousands of jobs for our Iwi. So we need to support our local growers, so the apples don’t rot on the trees. Mr Tomoana is working hard to encourage more community Iwi leaders to enter the apple industry. “For every 4 RSE workers, there is a permanent job for our local people and it’s not just picking apples. It’s a stair case career where there are so many diverse jobs and opportunities now. “I have picked apples since I was at High School and when the Tomoana Freezing Works closed down I picked apples for several years too. Mere and I also got married while we were picking apples. Mr Tomoana encouraged Bostock New Zealand Quality Controller, Waiora Tareha to start picking apples three years ago and the young mother has never looked back. “I got myself off the benefit and into work. With a young daughter to support I didn’t think a permanent job was possible. But I have been able to work school hours and enjoy the benefits of a great career as well as being a mum,” said Ms Tareha. Bostock New Zealand Labour Development & Resource Manager, Vikki Garrett says they really struggled to find enough apple pickers for the Royal Gala harvest this season. 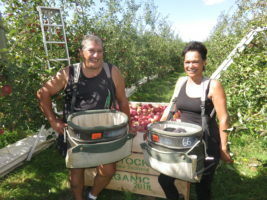 Ms Garrett is pleased Mr Tomoana has teamed up with local growers to encourage more locals to enter the apple industry. “Our priority is always putting locals first for local jobs. The labour shortage is a serious issue for our industry. We need to work with local Iwi, Education Providers and Government to ensure we have consistent and reliable pickers for the season,” said Ms Garrett.